These paintings are available as limited edition giclee' prints. Click on the links for more information and pricing. About Giclee' Prints. 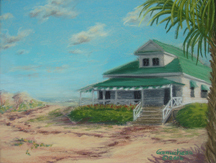 Pastel pleine-aire painting of the Myers Cottage which houses the Wrightsville Beach Museum, NC. Watercolor painting of Cattleya shroederae growing epiphytically in a mist forest. 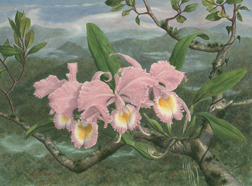 Original watercolor painting of the orchid hybrid Brassolaeliacattleya George King 'Serendipity''. Watercolor painting of BLC Ponkan's Southern Lady. 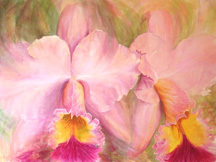 Watercolor painting of a Cattleya orchid hybrid, Lc Nigrescent 'Flare'. 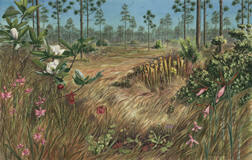 The painting depicts many of the other weird and unique carnivorous plants found in the area, including three types of pitcher plants, butterworts, sundews, and five types of orchids. 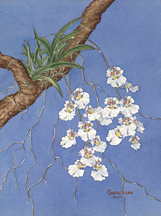 Original watercolor painting of the equitant oncidium(tolumnia) orchid hybrid cross Native Dancer. 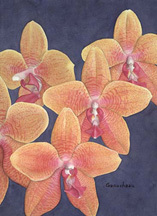 Watercolor painting of a golden phalaenopsis orchid hybrid cross, (Hausermann's Goldcup x violacea). Original watercolor painting of purple morning glories twining around a porch rail.